DETROIT, MI., – May 22, 2014 –Detroit Diesel Corporation (Detroit) already manufactures the industry’s most efficient and reliable engines, axles and transmission. Today, with the introduction of the new integrated Detroit™ Powertrain, featuring the Detroit DD15® engine, Detroit DT12™ transmission and Detroit axles, the Powertrain is now integrated to deliver even better performance to lower the Real Cost of Ownershipsm for customers. Available starting in January 2015 for the Freightliner Cascadia® Evolution and later in 2015 for the new Western Star 5700, the integrated Detroit Powertrain builds on the solutions developed by Daimler Trucks North America (DTNA) by providing state-of-the-art component communication that seamlessly work together. Detroit is able to accomplish the level of performance and efficiency the integrated Powertrain provides by designing, engineering, testing and manufacturing everything under one roof. Every individual product was studied to make certain they were specifically tuned to work together to deliver maximum efficiency. 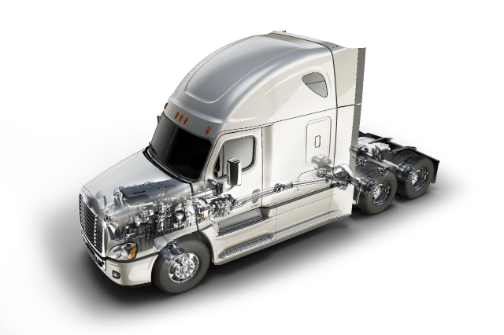 According to Brad Williamson, manager, engine and component marketing for Daimler Trucks North America, to create the integrated Powertrain, Detroit’s axle engineers developed a new axle ratio (and configuration) to match the engine rating. Engineers also tuned the transmission electronics to ensure all of the calibrations fit together perfectly to deliver the integration and performance customers demand. The integrated Detroit Powertrain features the flagship DD15 engine, with new downsped rating of 400hp and 1750 lb/ft. The downsped rating enables the engine to turn at lower RPMs regardless of road speed, ultimately reducing fuel consumption and friction. Because it delivers the necessary torque at these low RPMs is the engine is able to deliver the power drivers demand. The proprietary Detroit Virtual Technician™ On Board Diagnostic System is also integral to the Powertrain. The DD15 features the 1-Box™ emissions package that combines DOC, DPF, SCR catalyst and DEF doser, creating an optimal solution for a variety of truck configurations. The DD15 also meets OBD13 and GHG14 standards. Already engineered for economy and safety, the integrated DT12 continues to push the innovation envelope with the new Intelligent Powertrain Management (IPM). This powerful technology uses pre-loaded terrain maps and GPS to know the route ahead and automatically adjusts transmission and engine functions, resulting in an even smoother ride. Features such as eCoast, a technology specific to the DT12 that allows the engine to operate at idle of 500 RPM when road and driver inputs don’t require engine power to move the truck down the road, and creep mode, which improves low-speed maneuverability, perform with the Powertrain to benefit performance. Working together with the DD15 engine and DT12 transmission, the new Detroit rear axles integrate effortlessly to provide optimum performance. Detroit now offers a 6x2 configuration with a 2.28 ratio that is specifically designed to work with the downsped engine rating, making it the fastest ratio available in Freightliner and Western Star trucks while still providing the performance drivers demand. The 6x2 Detroit axle configuration incorporates a non-driven tag axle on the tandem, reducing total weight by almost 400 lbs., while a new 2.41 ratio in its 6x4 axle configuration is also available for applications requiring superior traction. The integrated Detroit Powertrain includes steer axles that use low-friction needle bearings for maximum maneuverability and minimal maintenance. Because all of the integrated Powertrain components were developed by Detroit, they not only share engineering and manufacturing processes, they are supported by the extensive Detroit Customer Support Center and the Customer Service network. With hundreds of authorized locations in the United States and Canada, factory-trained technicians and immediate access to maintenance information is always available. All authorized Detroit service outlets exclusively use Detroit Genuine Parts. For more information visit www.DemandDetroit.com. The new Demand Detroit App will be available for Android and iOS devices in early June. Detroit offers a complete line of heavy-duty diesel engines, axles, transmissions and telematics products for the commercial transportation industry in both the on-highway and vocational markets. Detroit products are sold and serviced through a network of hundreds of locations throughout North America. For more information, or to locate the nearest Detroit location, visit DemandDetroit.com. Detroit™ is a brand of Detroit Diesel Corporation, a subsidiary of Daimler Trucks North America.